In 1982 Musical Youth burst onto the charts with their first hit, Pass The Dutchie, a song which I still vividly remember to this day for its cool reggae beat and bizarre lyrics, especially the bom-bom-bom-bom-bom-bom-biddly-bom bit. Â The fact that the song was sung by a group of kids, the youngest of which was around my age at the time, also helped them win popularity from me. The band formed in 1979 and consisted ofÂ Michael and Kelvin Grant, Dennis Seaton and Patrick and Freddie “Junior” Waite. Â After Pass The Dutchie put them on the map with a number one UK chart song they had further hits with Youth of Today andÂ Never Gonna Give You Up (nothing to do with the Rick Astley song). 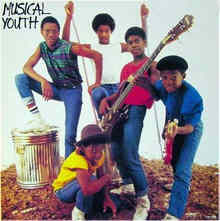 After these songs Musical Youth’s popularity started to wane, but they came back with a cover of Desmond Dekker’s 007, which led to their final hit Sixteen. Â In 1985 they broke up when Dennis Seaton left the band, but both he and the Grant brothers have remained in the music industry. In 1993 plans to reform were ditched when Patrick Waite died from a heart condition, but the remaining members did attempt another come back in 2001 when they were going to be playing on a tour entitled Hear and Now with other acts from the eighties. Â Unfortunately the tour was cancelled after the attack on the World Trade Center. Â They finally did play again in 2003 on a similar tour, although by 2005 the band was reduced to a duo of Dennis Seaton and Michael Grant. But it will be Pass The Dutchie that keeps the memory of Musical Youth alive for me. Â Despite being sung by a group of kids many people still believe that it was a song about drugs, when in fact a Dutchie is a kind of cooking pot. Â I guess the drugs reference is not surprising though when you consider that the song was based on a song by The Mighty Diamonds called Pass The Kouchie, which was indeed a song about cannabis. Â Check the song out in the video clip below, and try not to join in with the biddly-biddly-bom bit. This entry is filed under Music - Artists	and was posted on June 3rd, 2009. You can follow any responses to this entry through the RSS 2.0 feed. You can leave a response, or trackback from your own site.